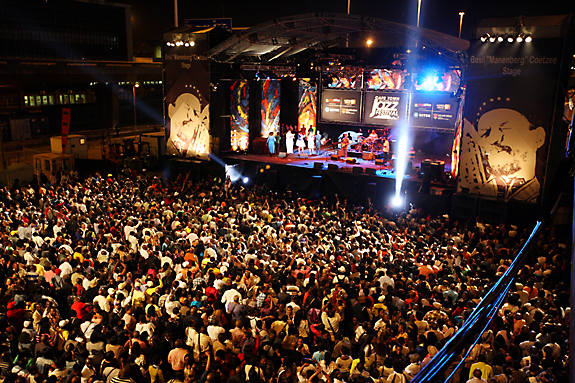 With only a few weeks to go, the Cape Town Jazz Festival is about to launch into its 13th year on the 30-31st of March. Bolstered this year by three additional international artists, the festival promises to be bigger and better than ever. The event has quickly become a member of the top 10 jazz festivals in the calendar of jazz and should definitely be on the not to miss list. Over the two nights it plays host to over 40 international and African artists. Among them this year is the legendary trumpeter and band leader, Hugh Masekela, returning home to join forces in a ‘Mama Africa’ tribute to the great songbird, Miriam Makeba. Masekela is also the festivals musical director this year. The Cape Town Jazz Festival has a blasting multi Grammy Award winning line up. Platinum gold selling vocalist James Ingram (USA), best known for hits like Baby Come To Me and How Do You Keep The Music Playing arrives for the first time. Returning is music icon and renowned jazz saxophonist Dave Koz (USA) with special guest Patti Austin (USA) in tow. Serious Jazz aficionados can relish in the sounds of the Brubeck Brothers playing alongside special guest Mike Rossi on sax. The younger audiences need not worry either. The indie hip-hop band Atmosphere (US) and South African born MC Jean Grae (USA) are all set to take the stages by storm, including local rising soul star Zahara (SA). Tipping this over into a Twitter trend is Zulu tweeting Jill Scott, who’s been brushing up on one of the official languages by tweeting in Zulu, ahead of her performance on the Kippies main stage. Three-time Grammy Award-winning singer-songwriter, New York Times best-selling poet, and critically acclaimed actress are only a few titles held by Jill Scott. In 2000, she released her much anticipated debut record, Who Is Jill Scott? – Words and Sounds, Vol. 1 – Jill Scott, a double platinum album that earned Scott several Grammy nominations, including Best New Artist. Two more critically acclaimed albums followed, Beautifully Human: Words and Sounds, Vol. 2 – Jill Scott and The Real Thing – Words & Sounds, Vol. 3 – Jill Scott which garnered two more Grammy Awards and spawned multiple worldwide tours. Other musical luminaries will include Dorothy Masuku, Herbie Tsoaeli, James Ingram, Marcus Miller, Lindiwe Suttle, Zakes Bantwini, Pharoahe Monch, IllSkillz, Nouvelle Vague, Adam Glasser, and Steve Tyrell. 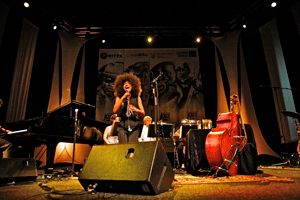 The Cape Town Jazz Festival may only run the main showcase over two days and nights, but it has other activities and sessions throughout the whole week, beginning 24th March. Among them are mentoring and arts journalism workshops, Berklee College of Music auditions, photography workshops and the Duotone Photo Exhibition, commemorating prolific jazz photography. One of the most exciting elements of the festival is the teaser to the main event. The free Community Concert brings thousands of people into the centre of Cape Town on Green Market Square. This well-attended event features some of the top headliners that will also be performing at the jazz festival. We look forward to reviewing Africa’s Grandest Gathering in full for 2013. Contact Tripos Travel on: Tel: +27 021 461 8613 for all your travel package requirements. Thanks for letting us know about weblink. Will update our database with correct details.